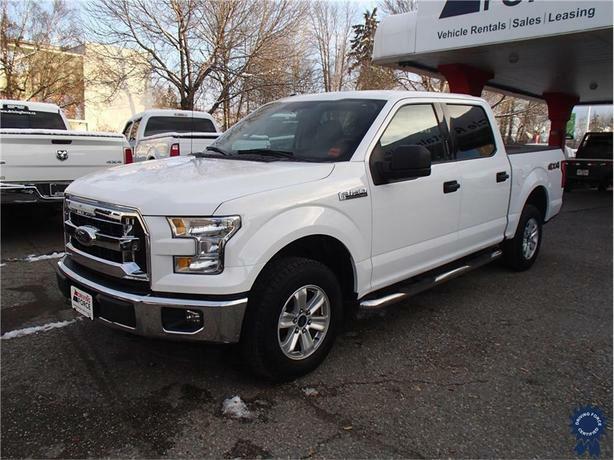 This 2015 Ford F-150 XLT Supercrew 6 Passenger 4X4 5.5-Foot Short Box Truck comes with a 145-inch wheelbase, electronic 6-speed automatic transmission, electronic transfer case, 3.31 axle ratio, 17-inch silver painted aluminum wheels, cloth 40/20/40 split front seat, Class IV trailer hitch receiver, wheel well liners, black vinyl floor covering, block heater, 200-amp alternator, SYNC Voice Activated Connectivity System, cruise control with steering wheel controls, three 12V DC power outlets, tire specific low tire pressure warning system, fog lamps, power windows, privacy glass, Bluetooth for hands-free calling, towing with harness and trailer sway control, auto locking hubs, 136.3-litre fuel tank, 1,600 lbs Maximum Payload, and GVWR rating of 7,000 lbs (3,175 kgs). The 5.0-litre V8 gas engine provides 385 horsepower at 5,750 RPM and 387 lb-ft of torque at 3,850 RPM. Touch base with us to discuss purchasing or financing options that are right for you and experience the difference you will only find at DRIVING FORCE Vehicle Rentals, Sales and Leasing.